Radau gan absurdiška evoliucijos modelį kuriuo dabar remiasi dabartinis mokslas. Kaip neandertalietis išplito teritorijoje jei jis galėjo maišytis ir su žmogumi ir su Homo Erectus? Iš kur Atsidaro žmogus ir kaip jis nukonkuravo savo protėvius jeigu žmogus gali gyventi tik kultūrinėje terpėje? Jei neandertalietis maišėsi su žmogumi kodėl jis nemigravo? Gamtoje taip plinta tik ugnis naikindama viska ką sutinka aplinkui. Realybėje vyksta maišymasis išlieka tos smegenys kurios geriau pritaikytos prie aplinkos. Žmogus negalėjo atsirasti iš niekur ir išskersti žmones ant kurių kultūros išaugo, nes jie skaitė save tokiais pat kaip jų tėvai kurie buvo ne žmonės. Anatomically modern humans (Homo Sapiens) first appeared in Africa somewhere between 300,000 and 100,000 years ago. 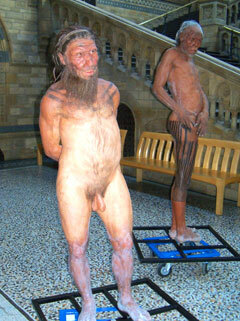 During this time, the Neanderthals (a totally different species of human) were living in Europe. Other species of early humans (perhaps descendent from Homo Erectus) may also still have been living in some parts of Asia at this point. Homo Sapiens appear to have made a failed attempt to leave Africa around 125,000 to 90,000 years ago. They started to expand northward into what is now Israel through the Suez region but were eventually pushed back by the Neanderthals. The first permanent departure from Africa is thought to have taken place via the Mandab Strait somewhere between 75,000 and 50,000 years ago. It is possible that the group that left at this time (and that went on to populate the rest of the world) was as small as 150 people! Around the same time, there was also a noticeable change in human behaviour. The rather sudden emergence of abstract thought dates from around this same time, evidenced by activities such as fishing, jewellry-making, funeral customs, cave paintings, musical instruments, etc. It is likely that the Homo Sapiens who left Africa continued to spread mostly along the coast, living on a diet of seafood obtained by beachcombing. They eventually made it all the way to India and beyond over a period of a few thousand years. However, no archaeological record of this journey exists as what would have been the coast is now underwater. From India, the Homo Sapiens would have eventually reached what is now the islands of Indonesia. At the time though, this region would have been one very large subcontinent. Usually referred to as Sundaland, this land mass would have been twice the size of India and located at about the same latitude as Africa. Whether or not Homo Sapiens came into contact with other human species in this region is unknown. The earliest Homo Sapien remains to be found outside of Africa are from Australia and date from about 45,000 years ago. This indicates that our globe-trotting ancestors had reached that distance somewhere around then. The archaeological record also shows that many animal species died out at around the same time, giving further evidence for this date. New Guinea would have been joined to Australia at this point, forming what is often called the continent of Sahul. Up until this point, Homo Sapiens had mostly moved east due to the fact that the Neanderthals dominated Europe. However, around 40,000 years ago, our species started to push into Neanderthal territory. Over the next 15,000 years or so, the two species lived together and probably fought against each other. It is also now known that interbreeding took place between the two species (the gene for red hair may come from Neanderthal ancestors). By around 30,000 years ago, the Neanderthals were gone. Whether they were simply assimilated into the Homo Sapien population or whether they were killed off by us is a question that is still debated. Humans probably reached the Americas for the first time somewhere around 15,000 to 12,000 years ago (although some scholars think it was earlier). Man's best friend, the dog, was likely domesticated around this same time, probably in East Asia. By about 12,000 years ago, Homo Sapiens had spread to all corners of the globe. By this point, the various human populations around the world had been isolated from each other long enough for differences in appearances to be seen. Shortly after this time, the earth began warming, the sea level began rising, and agriculture was developed. However, it wouldn't be until around 5,000 years ago that the first civilizations would arise and history as we know it would begin. See A Timeline of World History for the rest of the story. Tarp neandertaliečio realistinio vaizdavimo ir dabartinio žmogaus nėra didelio skirtumo, antropologai tą skirtumą daro vaizduodami neandertalietį kaip benamį žmogų. Pamėlusiomis kojomis ir ištinusiu veidu. Realybėje jų veidai buvo sveikesni negu dabartinių moterų kurios naudoja iš naftos pagamintą kosmetiką. Kitas vaizdavimas yra kaip ateivio ar beždžionės, protingi mokslo žmonės taip nesielgia atvaizduodami neandertalietį.